PizzeRizzo is the newest joint in Disney’s Hollywood Studios! 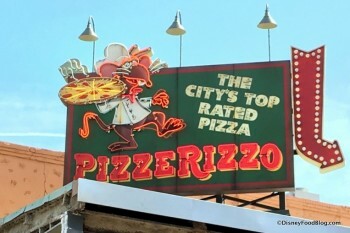 PizzeRizzo serves up pizza in Counter Service fashion, in a restaurant “owned and operated” by none other than the Muppet Rizzo the Rat! Unique touches to the location include a “cheesy” banquet room currently hosting a wedding reception as well as a special booth that Rizzo keeps for his celebrity VIP (Muppets!) pals. PizzeRizzo is located be in the former building for Toy Story Pizza Planet, which closed in January 2016. Will PizzeRizzo in Disney World’s Hollywood Studios Be Open During Your Next Visit?